What Is the All-On-4 Dental Implant Procedure? If you’re missing one or several teeth, you’re not alone. About 178 million people in the U.S. are missing one or more teeth, and 40 million are missing all their teeth. In the past, the only solution for missing teeth was dentures, but now dental implants are increasingly popular. As dental implants gotten more common, they’ve also improved, giving you an even better option when you want a way to improve your smile after losing teeth. The All-On-4 dental implant procedure is one example of a new take on the idea of dental implants. Here’s what you should know about All-On-4 implants before you decide which option is best for you. We beat matching implant offers by 5% Must have a written treatment plan from a local implant provider. Schedule Your Free No Obligation Implant Consultation Today! All-On-4 dental implants work similarly to traditional dental implants, but with a twist. 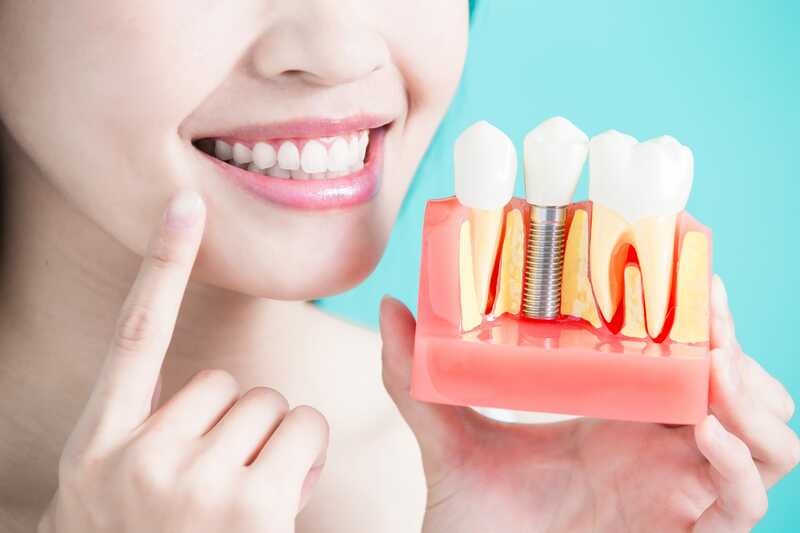 First, you should know that a typical dental implant is a titanium screw that is secured to your jawbone in order to replace the root of your missing tooth. After a dental professional screws in the implant, he or she will cement a crown on top of it so it looks and feels like a real tooth. But the All-On-4 dental implant procedure is a little different, because it means you only need four implants for each jaw, not a separate implant for every missing tooth. So once you get four implants secured to your top jawbone and four secured to your bottom jawbone, you’ll have a full set of teeth that look realistic and are strong enough to last for years. The main benefit of getting All-On-4 implants is that you won’t need an implant for every tooth you lost. As a result, the procedure typically costs less money and takes less time compared to installing a separate implant for every tooth. This should make it easier for you to get the smile you want as quickly as possible. Another benefit is that the titanium in the implants allows them to fuse to your jawbone over time so they eventually become part of it. This can help you avoid more jawbone loss in the future so you can retain the shape of your face, which means the area around your mouth won’t have the telltale sunken look it often does when people lose their teeth and part of their jawbone. Should You Get All-On-4 Implants? Most adults who have lost their teeth could benefit from this procedure. In general, if you want to replace the teeth you’ve lost, but don’t like the idea of using dentures for life, dental implants are a good idea. The All-On-4 implants allow you to get the procedure done quickly and efficiently so you can start seeing results as soon as possible. At the same time, not everyone is a good candidate for this dental procedure. You need to be in good health overall, with a strong immune system and enough bone left in your jaw to support the implants. When you let your dentist know you’re interested in this dental option, he or she will perform some x-rays to determine if you have sufficient bone in your jaws, or if you’d need a bone graft first. Then you can start preparing to undergo the procedure—and look forward to getting the smile you want. If you’re ready to find out if the All-On-4 dental implant procedure is for you, please contact University Avenue Dental Group today for a free consultation. If you want to replace missing or damaged teeth, University Dental in San Diego can help. We are the local dental implant experts, having performed countless procedures for patients in need. We have seen it all, and are confident we can help you revive your smile no matter the scenario. If you are interested in learning more, give us a call at 619-582-4224.